When rolling out a telepsychiatry program, one of the first things to establish is an effective telepsychiatry technology stack. A technology stack is the software and hardware that creates the infrastructure to support your computer systems. While that may sound daunting, it is not. With the right equipment, reliable software and appropriate training, you can run your program seamlessly. To help you get started, here’s our telepsychiatry technology checklist. Although investing in telepsychiatry equipment may seem like an expensive undertaking, you can be up and running for only a few hundred dollars. The most important item on the list? A quality internet connection with upload and download speeds of at least 4 Mbps will handle your videoconferencing needs. Internet service providers are delivering much faster connections than ever before, even at the most basic levels, so establishing a connection powerful enough for your program is relatively simple. Once your internet is up to speed, you’ll need a laptop computer with an internal camera and microphone. You can use Wi-Fi, but plugging directly into the computer can help improve connection reliability. The laptop can remain in a designated room or it can be secured to a cart, making it portable as well as preventing theft. You’ll also want to ensure that the space where the telepsychiatry sessions take place is welcoming for the patient. A quiet, private and comfortable area for the patient to sit during the session is ideal for confidentiality and building trust between patient and clinician. 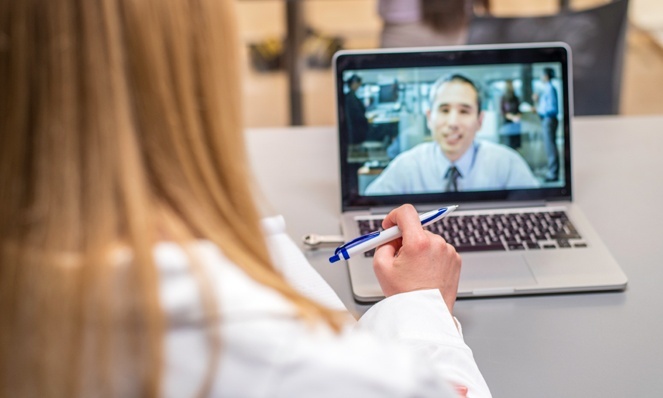 To connect patients and providers during their sessions, you’ll need a reliable videoconferencing software platform, such as RegroupConnect, that is user-friendly and not prone to crashing. You can use an existing platform if you’ve used telehealth in the past, or your telepsychiatry partner can recommend a system. While some facilities are concerned about security, it’s important to remember that telepsychiatry software is HIPAA-compliant and does not record or store any confidential patient information. Charting is done in your EMR, which your telepsychiatrist will be able to access. In addition, the RegroupConnect platform offers patients the opportunity to complete post session satisfaction surveys. By offering your patients the chance to provide feedback, you can gauge patient satisfaction and continue to refine your program as necessary. Your on-site staff is just as instrumental as your telepsychiatry providers for keeping your telepsychiatry technology running smoothly. Before launching the program, train your staff on all aspects of the technology, from initiating each patient’s session to collecting patient survey data. On the clinician side, make sure your telepsychiatrists are comfortable with the platform and charting in your EMR. Enabling all parties to work together and understand the platform, equipment, and the workflow is key for positive patient outcomes. Mental health often requires collaborative treatment for complicated issues, but providing your patients access to that treatment doesn’t have to be complex. Without spending much money or making significant changes to your existing program, you can build an effective telepsychiatry technology stack that yields robust results.